Early this year Uber was caught in the middle of yet another controversy over what people perceived as opportunistic business tactics during the airport protests against Trump’s anti-immigration order. 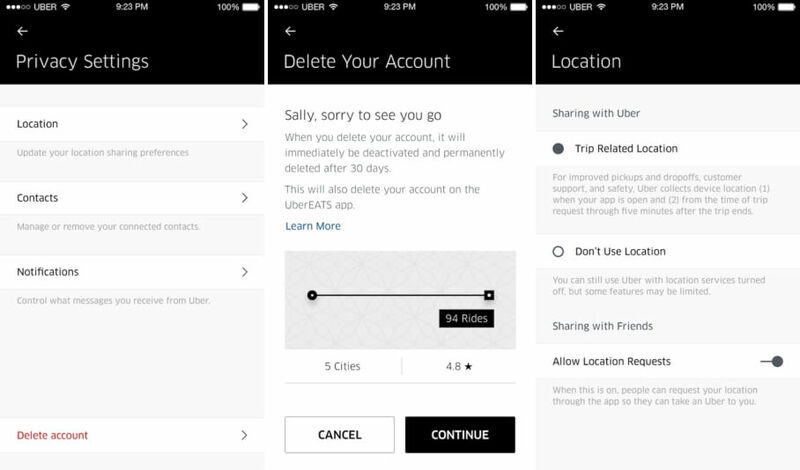 The #DeleteUber campaign caught on on social media as a result, but while deleting the app from your device is simple enough, canceling your account with the ride-hailing platform was a different story. Currently, users have to contact Uber support to eliminate their personal information. A new update will be changing that soon, however, by including a Delete account option within the app’s privacy settings screen, which will start a 30-day countdown and unless you change your mind and cancel it, all your customer data will be automatically deleted from Uber’s servers when the clock hits zero. The timing for the release is curious but the company told The Verge that the feature has been in the works for "more than a year" and isn’t meant as a direct response to the #DeleteUber campaign — which reportedly saw more than 200,000 users delete their accounts. The update will also include new settings to give users more control over notifications and how your location is used within the app. You can set the app to not draw location data from your phone at all, instead having you type in addresses, and there’s a toggle to share your current location with friends, which is handy if you need to meet up with them somewhere when hailing a ride.